Puppet known since prehistoric times which is about 1500 years before Christ. Indonesian society embracing animist beliefs in the form of ancestor worship of spirits called or dahyang hyang, manifested in the form of statues or pictures. 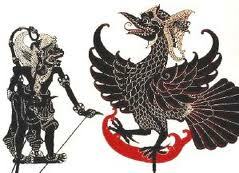 Wayang is the Indonesian traditional arts which primarily develops in Java and Bali. Puppet show has been recognized by UNESCO on November 7, 2003, as an amazing work culture in the field of narrative story and legacy of the beautiful and very valuable (Masterpiece of Oral and Intangible Heritage of Humanity). There are puppet versions played by people with costumes, known as the puppet people, and there is also a puppet in the form of a set of dolls that are played by the puppeteer. Puppet played this mastermind such a puppet show or wayang kulit. The story is told in the wayang performance usually comes from the Mahabharata and Ramayana. Puppet show in every country has its own techniques and style. Thus, Indonesia is a puppet made ​​by indigenous people of Indonesia who has a story, style, and extraordinary puppeteer. Sometimes repertoire Panji stories and stories Menak (Islamic stories) performed well. Puppet, by the predecessor of this country contains a very deep meaning. Sunan Kalijaga and Raden Patah was instrumental in developing a puppet. The Guardian in the land of Java has been set up in such a way into three parts. First Wayang Kulit in East Java, both Wayang Wong or Wayang in Central Java, and the third Marionette Puppet in West Java. Each very bekaitan one another. Namely “Where the contents (Wayang Wong) and Where the Skin (Wayang Kulit) should be sought (Puppet Marionette)”.